The recent TTC Board meeting was over quickly, but contained a few nuggets of interest in the agenda. As I have already reported, discussion of the Bombardier streetcar order triggered questions about the next round of subway car purchases, but that topic will not be dealt with in detail until the September 2017 Board Meeting, at the earliest. With respect to the order for 204 Flexitys now in progress, CEO Andy Byford reported that deliveries remain on time to the current schedule, although from his recent conversation with Bombardier he advised that achieving the 2017 target of 70 cars in service will be a challenge. In all transparency, yesterday Bombardier informed the TTC months ahead that there is a potential challenge to meeting the full target of 70 streetcars for 2017. This is a potential, very limited, short-term issue. This does not mean Bombardier will not reach its target for 2017. We are deploying extraordinary resources to ensure we can work towards continuing to meet our deadlines in the next five months. This includes extending our work week in Thunder Bay from five to seven days, adding resources in all our sites and flying rather than shipping streetcar cabs from Vienna to save a month in the transportation time it would take by sea. All cards are on the table. No stone will be left unturned. The costs of these increased measures, from ramping up working hours to the $750,000 Antonov flights, will be entirely covered by Bombardier to reinforce our commitment to the TTC and Toronto transit riders. Since launching its turnaround plan last year, Bombardier has met every single quarterly delivery commitment in the past twelve months and our focus and dedication remain entirely the same. We are still fully on track to deliver the entire fleet of 204 streetcars by the original contract deadline of 2019. The delivery plan (taken from the CEO’s Report) shows where the challenge really lies – in ramping up production from five cars every two months to fifteen. 4440 is the most recent car to arrive in Toronto, although it has not yet entered service. As I write this (July 14), there have been no reports of the two remaining July cars leaving Thunder Bay. That the Toronto Transit Commission conduct a market sounding and prequalification process to assess those companies that would be interested in bidding onk potential contracts to supply Light Rapid Transit Vehicles. The TTC Board endorsed this proposal although its primary effect may only be to serve notice on Bombardier that contract performance and flexibility in future negotiations will be key. The roll out plan for new cars now foresees that Flexitys will begin operating on 512 St. Clair in September, and on 504 King in November. Between the two routes, about 70 new cars will be required on a 1:1 replacement basis, or fewer if there are offsets through headway widening or new service design. Based on the delivery schedule, full conversion of the two routes would finish midway through 2018. The report includes a dashboard showing the status of major projects, most of which are in good shape. [p. 8] A notable exception is the Scarborough Subway Extension. There was a flurry of Twitter activity recently because this was reported as “news” when the status chart actually dates from May. More generally, the project status has been in poor shape for quite some time simply because there are significant technical and cost issues yet to be resolved. While these are outstanding, there will be no change in the reported status. Note: In the following charts, the maximum value used for the Y-axis is not consistent between charts that track the same metric. Comparisons between charts should be done with care. Ridership for 2017 continues to run below projections. On a year-over-year basis, ridership is marginally up from a year ago by 0.3%, but weekly values are currently below last year’s results. Measured against the budget which assumed a modest increase over 2016, ridership is running 1.9% below projections. 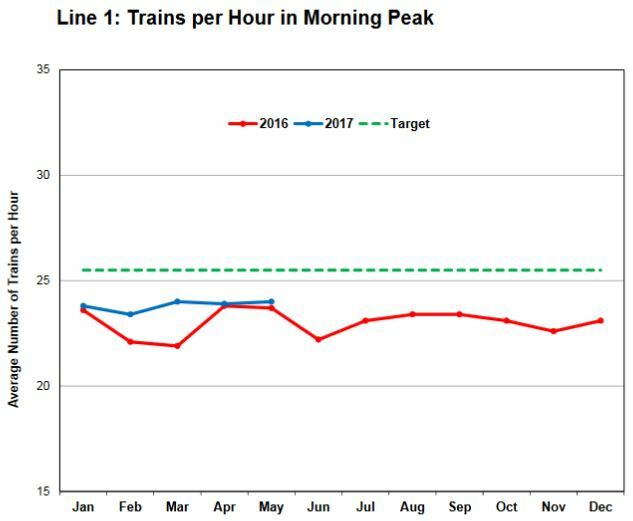 Subway reliability holds up at consistent levels, but has still not achieved the goals set for it. 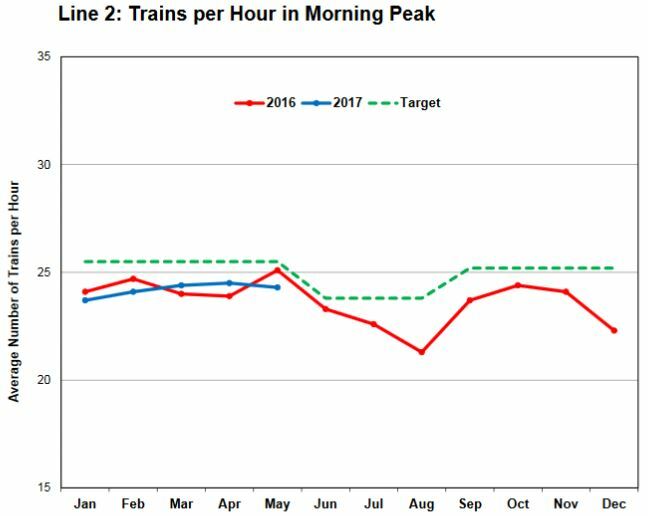 For 2017Q1, the number of delays is running above target but below last year’s values while the delay minutes have improved, especially on 1-YUS compared to 2016Q4. Delays are generally being cleared faster in 2017 than they had been in 2016. The throughput of trains/hour at critical points on the subway remains below the scheduled level. This means that the capacity provided, on average, is less than the value cited when the TTC talks about how many riders the subway can carry at the design loading standards. departures. Efforts to improve all ten routes are continuing but overall performance is expected to decrease with the summer construction in the downtown area. Considering that “on time” is measured as a departure from terminals where vehicles often have enough time for a layover, and the rather generous standard by which being on time is measured, the low numbers for this metric go a long way to explain erratic service on the streetcar routes. My own reviews of recent streetcar operations (not yet published) show that erratic departures from terminals continue to plague these lines even when buses are substituted as on 501 Queen. This is as much a question of corporate culture, the assumption that service cannot be better, as it is of “congestion”. Short turn stats are better partly through schedule changes, although this can be counter-productive in that long layovers and sluggish driving speeds can result. For bus routes, the stats are somewhat better than for streetcars, but still not at the target level. Vehicle reliability varies depending on which part of the fleet one considers. For the subway, the T1 fleet on the BD line are meeting their target, and the TR fleet on the YUS line are showing spectacularly high MDBF values. One time spikes such as that shown for the TRs in May must be treated with care because the number of incidents is comparatively low, and a small change in the number reported can have a big effect on the monthly averages. Although not part of the charts below, the TTC reported that there were no failures causing delays of five or more minutes on the YUS for the first two weeks of July. For the older streetcars, the distance to failure continues to be poor. ALRV numbers are improving, but this is simply tracking values from 2016. It is not yet clear whether the rebuilding program now underway for part of this fleet will bear fruit later in 2017 by comparison with the falloff in 2016. For the new Flexitys, the MDBF remains far below the target, a value which contractually must be obtained by the time of the 60th car’s delivery in late 2017. Unless there is a massive improvement in reliability across the fleet in the near future, this target will not be reached. In May, 15 of 27 delays were related to doors, or about 60%. Even if these problems were eliminated, the MDBF would at best rise to 15,000km, less than 50% of the target value. Doors are quite clearly not the only subsystem on these cars whose reliability must improve. 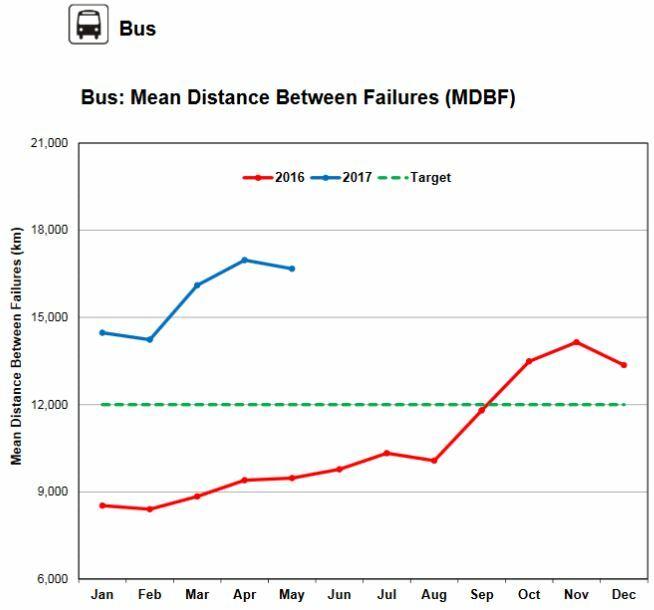 Bus reliability continues to run well above 2016 and for the fleet target. This is the combined effect of the retirement of older, unreliable vehicles and of improved maintenance practices. 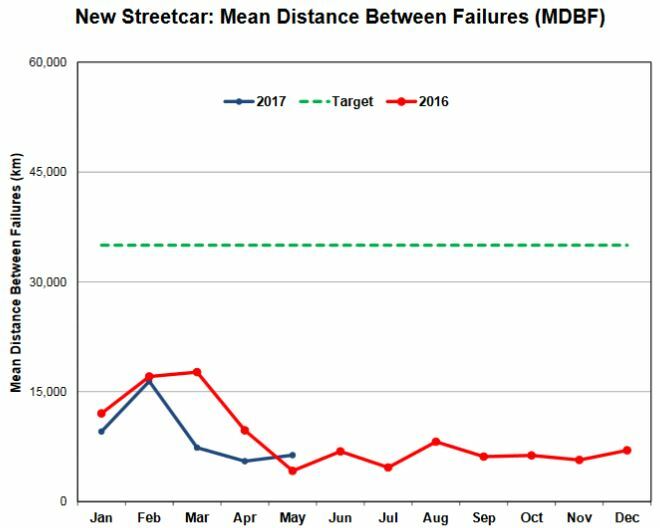 As a matter of comparison, note that the target for buses is very much lower than the target for new streetcars. A new metric added to the CEO’s Report this month shows the amount of service operated as compared to budget. The scheduled streetcar service is running below budget because bus substitutions count against the bus mileage. The result is that the degree to which “bus” service exceeds budget is misleading when the service many buses provide is on streetcar lines. On a related note, under the topic of the “Customer Charter”, the CEO’s Report lists many bullet points from the Charter, but neglects to mention one that is included on the TTC’s website. In fact, the TTC has not published route level reliability statistics for two years. Of course, the standards are so lax, and the values are measured only at terminals, that the numbers would be almost meaningless in comparison to day-to-day rider experience. Financial results continue to run favourably despite lower than expected ridership and revenue. The situation is so good that a planned draw from the “stabilization reserve” will probably not be required. The TTC regularly comments that it is unable to run as much service as it should, based on actual riding counts even with below-target numbers, because it does not have enough vehicles. This begs the obvious question that if the fleet (and associated staffing) were not a constraint, would the TTC be able to afford to run all of the service its “standards” imply is required? Cost overruns and missed schedules for two major TTC projects – the Spadina subway extension to Vaughan (aka TYSSE) and the Line 1 YUS resignalling – triggered a review of TTC project management by the City of Toronto. KPMG, who have done other management reviews for the City, was hired in fall 2015 and reported in September 2016. Readers are free to browse through the full report and presentation, but the high points deal with the question of responsibility for project approval and management at the executive and Board level. Similar processes will find their way into major City projects too, but this report addresses the TTC. 1. Project Categorization. The TTC’s capital projects are each of varying degrees of risk and complexity. As the risk and complexity increase, the requirements of project governance and control change, as should the escalation of issues to the Board. Using a “Project Categorization” process will help ensure the appropriate governance and project management rigour [are] in place for each project, with an emphasis on the requirement to balance the Board’s accountability with the ability of management to operate efficiently. 2. Stage Gate Process. As a project proceeds over time, it is important to set certain check points, where the project is assessed to ensure it is still meeting the intended objectives. These ‘gates’ within the new Stage Gate process are a way of ensuring regular and consistent touch points with the Board. This process will also bring increased rigour and visibility to the Board on the progress of individual projects. KPMG recommended that for category 3 and 4 projects, the TTC’s largest and most complex, there are default stage gates that the Board should be engaged to approve project deliverables (i.e. business cases, project governance structures, stage gate timelines, etc.). 3. Project Delivery Model. At a defined stage gate, there should be a determination of the way in which a project is delivered (i.e. the project delivery model). The recommended delivery model should not be predetermined, but rather the outcome of a comprehensive risk-based decision process. Ultimately, every project is unique and all procurement options should be considered. Recently, the TTC Board has become much more aware of the importance of risk management not only as it applies to the continued operation of the transit system under day-to-day circumstances, but to the need for oversight on major contracts. Quite bluntly, the TTC Board has been missing in action on this front for several years with a concentration on “good news” and an overwhelming desire to save money. Oddly enough, the latter goal has rarely been informed by a clear and thorough understanding of requirements and effects – beneficial or otherwise – because Board members who are also Councillors are used to a less hands-on approach to city management. Anyone who has read through the TTC Capital Budget, all 1,000 pages of detailed project descriptions, knows that the lion’s share of projects do not require oversight at the Board level. Only the large, complex projects with substantial cost and potential for substantial side-effects of delay or failure need this level of scrutiny. However, a formal process is still needed at the management level to ensure that projects actually have been reviewed and are tracked. Of the four proposed categories, the first two deal with small and medium projects that do not generally require Board intervention. The third category contains large, complex projects with substantial effects within the TTC, and the fourth generally contains system expansion projects that will involve multiple agencies, sources of funding and political control. The “stage gate” process brings a requirement for regular project review so that work does not simply continue on momentum after the most cursory of oversight and an early political approval. This will be the most challenging task facing the TTC and the City because it runs directly contrary to the way many large projects are launched and managed today. Showing up with a map drawn the night before a press briefing and telling the world “this is my plan” simply won’t cut it beyond the most general of “vision” exercises, and even then will be suspect depending on what political motives underlie an announcement. Politicians do not like to be told that their plans won’t work. They expect them to be implemented, or at least advanced through endless stages of photo ops and re-announcements. Many studies have run aground on phrases like “the Premier announced” and “the Mayor’s platform said”. Advisors to politicians are motivated to make their bosses/clients look good, not to be good engineers and planners, as we have seen in a few recent and current megaprojects. … allow the governance bodies to ensure the project is still meeting its objectives and to provide authority to proceed to the next stage in the project lifecycle. … for assessing project or progress against schedule and cost. This reporting is done in standard routine reporting through the governance structure as a part of day-to-day management of the project. These are important distinctions, and there are underlying assumptions. First is the premise that there actually is regular reporting of schedule and cost tracking so that projects do not run for extended periods until a stage gate is reached and the project is in serious trouble. Second: if a project is not meeting its goals, the project oversight group should be prepared to take a step back rather than forging ahead (“in for a penny, in for a pound”). Third: project changes need to be subject to the same rigourous reviews that the original scheme faced to avoid a “back door” mechanism with scope creep. This is a fundamentally different way of approaching large projects at the TTC where far too many decisions are politically driven and the desire for simplistic, good news (“on time, on budget”) reporting is all those in charge want to hear. Pet projects tend to fare poorly when subject to detailed scrutiny, but political promises, especially those on which someone’s election has been based, are often beyond challenge at the management/staff level. “Project Delivery” deals with the question of whether a project should be design and managed in house by the TTC, or to varying degrees by a third (private) party. There are benefits to external consolidation for very large projects, but this requires a degree of project definition and management by the “owners” (e.g. the TTC) that would not necessarily exist otherwise. The analysis of risk transfer and exploitation of large project expertise by a private sector “partner” has been coloured by the political assumption, even dictate, that PPP is the way to go. A major challenge for the TTC will be to determine when “traditional” project delivery is the better choice, and this will be difficult in a setting where two big TTC projects are poster children for the ills of public sector management. It is worth remembering how some of the cost overruns arose with the TYSSE and resignalling projects to put these recommendations in context. The TYSSE, originally a line to York University (for which the university lobbied for years), later to a proposed “Metropolitan Centre” in Vaughan, is a political animal. Something was always going to be built, the question was merely what it might be and how far north it would go. After the penny-pinching of the Harris era at Queen’s Park when even Downsview Station (now “Sheppard West”) was criticized by some as being excessive in its decor, there was a desire for architectural statements befitting a new subway into the new north-west territory. As the cost estimates and tender prices for stations rose, this was addressed not by reviewing the rationale for such expense, but by raiding the contingency budget that was intended to deal with unforeseen problems during construction. Subdividing the project into many contracts satisfied demands in the construction industry that the TTC (and City) not shut out the medium-sized players through a single, turnkey contract. However, this created a problem where co-ordination of the many parts, and the cascading effect when one contract ran late, fell as a risk and cost to the TTC, not to those building the line. What has now become the Automatic Train Control project was originally intended simply to replace the original 1950s-era signal system on the oldest part of Line 1 YUS. However, in order to access funding from various governments, this was “sold” as a scheme to improve subway capacity. In fact, it was only a replacement for existing signals using comparable technology, and would have little benefit for overall line capacity. Various add-ons to the signal project including, eventually, automatic control over the entire line brought multiple vendors and incompatible technologies, a situation that was eventually “solved” by more or less starting over with a single vendor. Neither the original TYSSE budget nor the contract for the TR trains on line 1 included automatic train control. The original scheme for a mixed mode signalling system would have seen non-ATC trains including works equipment operate with more restrictive rules using conventional signals, although how exactly this would work was never clear. With the move to full ATC, all equipment that will run on lines 1 and 4 (Sheppard, effectively a branch of Yonge) must be ATC-equipped. Extension of Line 1 and provision for additional service with ATC requires a larger fleet, and that triggered expansion of storage facilities. Many of these projects were individual budget items that were not flagged as part of the original TYSSE and resignalling project authorizations, but which followed as necessary additions. There is a similar situation today with the proposed Scarborough extension as I described in a separate article. Much more is needed in order to actually open the SSE for service than simply building the line, and some major components are not included in the TTC’s capital plans either because of City limits on future borrowing, or because TTC management has, thus far, budgeted only preliminary planning funds without provision for actual construction. Throughout the years when both of these projects were underway, there were few if any reports to the Board, certainly none in public, to suggest that things were not humming along smoothly. From a personal viewpoint, as one who has watched the TTC and Council for decades, there was a real sense that being “in the dark” was right where the politicians preferred to be because delicate matters of project timing and funding, not to mention the rationale for past decisions, could remain out of sight. That is the context in which the KPMG report and its proposals is most troubling. A more robust approach to project design, approval and management will require a far better understanding of how the TTC “works” by those responsible for it at the political and management level. The siloed nature of some planning and the lack of broad awareness of how many projects fit together as a whole simply cannot exist in the well-informed, well-managed environment KPMG envisions. The TTC Board has a responsibility to ask about and be informed on how the parts of its capital plans, and by extension future operating plans, fit together, and management has a responsibility to provide the information. This is not simply a matter of tracking what is already on the TTC’s plate, but of asking “what if” questions about where the TTC might be going and what is required to get there. Such questions run head-on into political demands both for spending control and that announcements, if any, come from political sources without embarrassing caveats from staff. I look forward to seeing how well the TTC’s new project management committee actually works and the degree to which in engages in meaningful oversight, review and planning. This entry was posted in A Grand Plan, Finance, Streetcars, Subways, Transit. Bookmark the permalink. Looking towards the future here do you actually expect the TTC to go with Bombardier when ordering trains for the SSE? Given their performance with the Flexities it would not be out of the realm of possibility for them to look at Alstom. Personally I think this may be the end of Bombardier with the TTC. The T1 trains will need to be replaced eventually and nothing is worse than closing a subway line due to an insufficient number of trains. Even ordering from Bombardier and having the SSE opening delayed because of insufficient trains on site would be political suicide. Steve: But the TRs are an established product with very good performance. There is no basis for throwing Bombardier out of the mix on that score, and by the time any T1 replacements are ordered, we will know just what their performance on the whole Flexity order has, or has not been. What Bombardier has really done is pissed on the “we’re quality and we’re the only Canadian company worth looking at”. They have been too used to getting contracts automatically, and the family obsession with the aircraft business threatens the whole organization. If the rail unit is spun off, it will be interesting to see who winds up in control and whether the Thunder Bay plant has a future. It is very difficult to spin off the rail division. A lot of the technology is derived from the aerospace division. This is not about spinning off some snowmobile making like Bombardier Recreation Products. As rail cars get faster and goes to more places, conventional designs do not work. For example, cabin pressurization allows the Chinese HSR to be much quieter than the Amtrak Acela Express. There are more synergies between the two division. Bombardier Transportation lost the Acela contract already to Siemens. Losing more North American contracts will not be good for them. Germany is a founding member of the AIIB, so that they get a head start in projects in Africa and the Belt and Road Initiative countries. Asia is virtually a no go for Bombardier. The Chinese and Japanese compete heavily there. Look at what the Chinese did to secure the Indonesian HSR project. Only Europe and the Americas are where Bombardier can sell their products to. On a side note, once the CSeries succeeds, it will divert attention to do a CRJ replacement and an update on the Q400. On the business jet side, they have a few more Learjet and Global projects left. A lot of the rail projects are site specific. For example, the Jet Train is not marketable in Europe as most of the lines are electrified. Jet Trains are only marketable to North America where most lines are not electrified. There is not much on the road map for Bombardier Transportation. For the record, this is my opinion based on publicly available industry materials. I am not an insider at Bombardier. What good does turning it back on the opposite side of Lake Shore do if that’s where this alleged congestion is? Why is the 509 running if there is this congestion? Steve: This does not make any sense at all. The last few years during large events at the Exhibition the TTC for some reason feels that it is necessary for the 509 car to be the only ones on the right of way on Harborfront. The problem is most people don’t know this and all it does is over crowd the line and the only places people can get on or off of the streetcars on the 509 route are at Exhibition and Union. Normally when Harbourfront is busy the 510 car isn’t that full and can pick up the people stuck waiting as a full 509 rolls by the stop. The traffic congestion Jonathan asks about was probably the Honda Indy. I gave up waiting for a streetcar at Spadina station on Sunday afternoon. I don’t think they were close to the supposed four-minute headway, short turns or not. Steve wrote: The roll out plan for new cars now foresees that Flexitys will begin operating on 512 St. Clair in September, and on 504 King in November . However, the TTC’s New Streetcar webpage says 512 St Clair in 2017/2018 and 504 King in 2018. I know that the November date appeared in a TTC report that both you and The Star had shown in articles. So, has the rollout schedule changed? I sent emails to the TTC asking for an explanation of the discrepancy but without success. Steve: Yes, the schedule has changed because of the King Street project. I checked that with Brad Ross because Andy Byford had talked about new cars coming onto King in the fall at Council.